Treasure Island in the San Francisco Bay. San Francisco officials plan to build high-rise residential developments on the former Navy base. As U.S. Navy officials readied a report this summer acknowledging a broader history of radioactive contamination at Treasure Island, they also sought to prevent California health officials from adding to the written record their concerns that the cleanup had been mishandled, according to internal emails. The Navy acknowledged for the first time on Aug. 6 that the former Treasure Island Naval Station, where San Francisco plans to build a 20,000-resident high-rise community, was home to a repair and salvage operation for the Pacific fleet and that some of those ships could have been contaminated with radiation. The draft report also said that a school preparing sailors for nuclear warfare might have left behind radioactive residue. The study came in response to regulators with the California Department of Public Health, who since 2010 have pressed for details after cleanup workers found radioactive waste in unexpected locations. Internal emails show that health officials asked the military as recently as mid-May to step up radiation testing efforts. Military officials, meanwhile, pressed for health regulators not to present their concerns in writing. On May 10, Anthony Konzen, a Navy manager of the Treasure Island cleanup, wrote in an email that he did not believe that California public health officials had the authority to regulate the cleanup of radioactive materials. “I don’t believe comments will be needed,” he wrote. The California Code of Regulations gives the health department the authority to certify whether radiation levels in a vacated facility are safe for human contact. Navy officials, however, emphasize the primacy of federal Superfund cleanup law, implemented by state toxics officials. A health department spokesman explained in an email that the agency provides radiation expertise to cleanup officials and it enforces California laws designed to protect the public from harmful effects from radiation. On May 15, Navy cleanup manager David Clark exchanged emails with a state toxics official saying it would be better if health officials only expressed their concerns verbally during meetings. “It would be nice to avoid another letter if we can answer the questions now,” Clark wrote. On May 17, James Sullivan, the Navy’s environmental coordinator also expressed a wish not to see public health regulators’ written memos. “If you receive the memo, don’t send it to us,” Sullivan wrote to a state toxics official. “If after your review, DTSC (Department of Toxic Substances Control) is not satisfied with the content, and/or if it is not clearly written and to the point, I would recommend sending it back to CDPH for revision. That way, the Navy does not receive any memo from CDPH that DTSC has not endorsed.” He followed up to say his Navy superiors agreed. Nonetheless, four hours later senior health department physicist Larry Morgan produced a memo criticizing the Navy’s handling of the cleanup. “There have been several (high-radiation) shipments and about a thousand intermodal (containers) of radium waste shipped from Treasure Island,” he wrote, adding that previous Navy explanations for the radioactive waste on the island were insufficient. 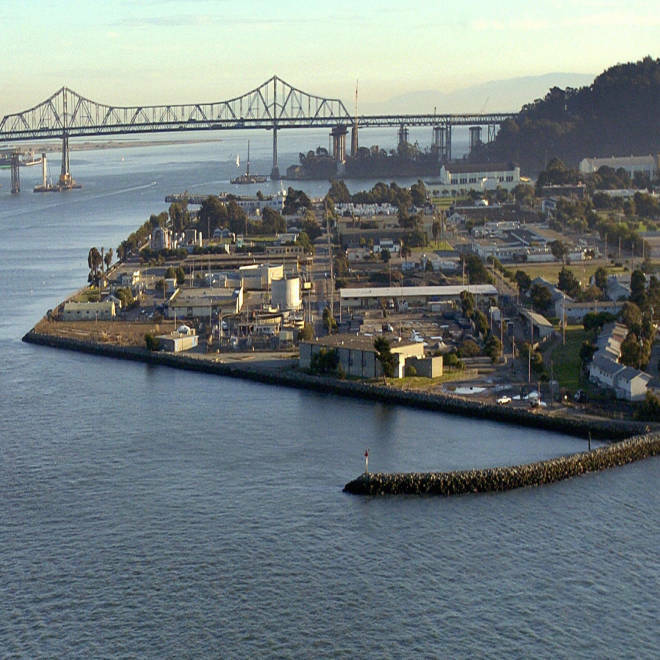 The Navy took 1,500 soil samples throughout Treasure Island testing for chemical waste, yet failed to examine them for radioactivity, despite the possibility they were contaminated, Morgan wrote. “This is not an acceptable” radioactive cleanup, he wrote. The memo included an attached 2011 message saying the Navy had failed to respond to requests for documentation of its work, and that it had been ordered to halt operations because workers had been improperly transporting radioactive waste. Unless the Navy followed health department orders, the city of San Francisco would be saddled with decontaminating the island itself, the attached message said. Morgan followed up with a June 6 memo urging the Navy to broaden its search for potential radioactive contamination and conduct long-term testing for the possible presence of elements such as cesium-137, a carcinogen used in industrial instruments, and which is also a byproduct of nuclear explosions. By writing the memos, Morgan’s concerns are part of the public record. In its Aug. 6 report, the Navy responded that cesium-137 was not a problem because devices containing the element had been handled properly over the years. Some Pacific fleet ships were exposed to Cold War atomic blast tests. But Navy officials said at an Aug. 21 community meeting that only decontaminated ships were berthed at Treasure Island. About 20 island residents attended the meeting, alarmed by the recent disclosures after learning of them through coverage by The Bay Citizen, sister site of California Watch. Many complained the Navy had not fully informed them about potential radioactivity near their homes. One resident questioned asked why the California Department of Public Health was not represented at the meeting. In an interview, Sullivan said that his May 17 message sought to make sure he only received opinions from the proper agency. In his view, that’s not the Department of Public Health. In a conference call interview, three state toxics officials said they disagreed with health department physicists who have claimed since 2010 that the Navy botched its radiation cleanup. Treasure Island is safe for human habitation, they said. However, Saul Bloom, head of the base-cleanup watchdog Arc Ecology, said the Navy’s base cleanup program has a history of seeking the most lenient regulator. Bloom, along with former San Francisco Board of Supervisors President Aaron Peskin, has sued the Navy for allegedly conducting an inadequate Treasure Island environmental review. The Bay Citizen is a nonprofit, nonpartisan, member-supported news organization covering the San Francisco Bay Area.